These cramped city streets are rundown and full of danger, even more so at night. There are signs that this neighborhood was once respectable, as evidenced by the guardian statue at the major intersection. Now only a handful of businesses are still in operation. The rest of the structures are falling apart and inhabited by drug addicts and squatters. This map was created as a supplement to a Free City of Greyhawk adventure in my Age of Worms campaign. 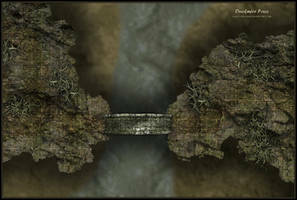 This map was created using Photoshop and features objects found on the Dundjinni forums site. Thanks to the talented artists there who post such great stuff. I really love your use of light. It's something I haven't mastered. What's your process? Thanks. I have about 3 layers I work with to make the lighting effects for a night map. Once the buildings, objects, etc. are in place, I make a dark blue/indigo layer and set it to Multiply at 50%. Then, I make the torch lights with circular gradients, erase anywhere the light wouldn't normal go due to it's placement, and set that to Soft Light or Hard light, depending what looks best. Sometimes I have to use 2 of these per light source to get it right -- a small bright glow around the torch, and wider more faded light around that. Once these are done, I select the light gradients I made, then switch to the Multiply layer and delete the darkness. Finally, I make more shadows where I think necessary coming from those light to give the maps a more dramatic effect. Play around with this idea, see what you can do. You rock. I'm messing with it right now! 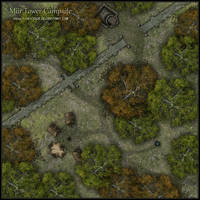 This is a great map Hero - very atmospheric and lots of places to hide and ambush. Thanks so much Jacktannery. Though I made this map specifically for my campaign, I'm always thinking about general uses for other people's games. Glad you like it. Excellent! Do you have a daytime version as well? I sure do Bogie. I loaded it up a few weeks ago. Check my gallery. And, glad you like the map. Silly me for not recognizing it! No wonder it looked familiar! Keep up the good work!